As Donald Trump’s national security adviser, John Bolton, wields ever greater power over U.S. foreign and defense policy, with Defense Secretary James Mattis due to be the next victim of Bolton’s “house cleaning,” the U.S. Agency for International Development (USAID) is preparing Libya for a neocon-led “nation-building” operation. Although Trump has slashed funding for USAID, the agency has found the necessary budget to begin to prepare Libya’s local municipal councils for elections. "Conservatives are accustomed to liberals not understanding the zoology of our movement. But the use and abuse of the term 'neoconservative' has exceeded even the high allowance for cliché and ignorance generally afforded to those who write or talk about conservatism from outside the conservative ant farm. 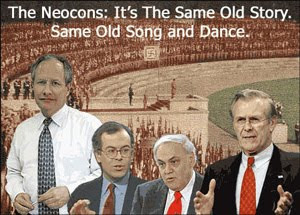 In fact, neoconservative has become a Trojan Horse for vast arsenal of ideological attacks and insinuations. For some it means Jewish conservative. For others it means hawk. A few still think it means squishy conservative or ex-liberal. And a few don't even know what the word means, they just think it makes them sound knowledgeable when they use it." © 2000-2019 by BATR All Rights Reserved. Simple theme. Theme images by luoman. Powered by Blogger.